Preheat the oven to 325 degrees. Prepare a baking sheet by spraying it lightly with cooking spay. In a large bowl, mix together the oats, flour, brown sugar, salt, cinnamon, nutmeg, pecans and almonds. In a separate bowl, stir together the melted butter, maple syrup and vanilla. Spread mixture out over the prepared baking sheet. Bake for 15 minutes. Flip the granola and bake for an additional 15 minutes. Add the cranberries. Stir up the granola. Bake 2 more minutes. Remove from oven. Granola will continue to crisp as it cools. 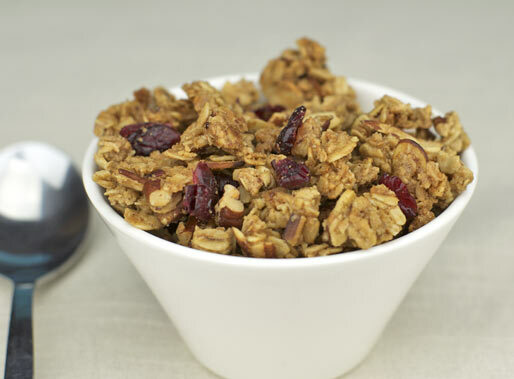 Allow the granola to cool completely before serving or storing. This stores well for a week in an sealed container. Ho! Ho! Ho! 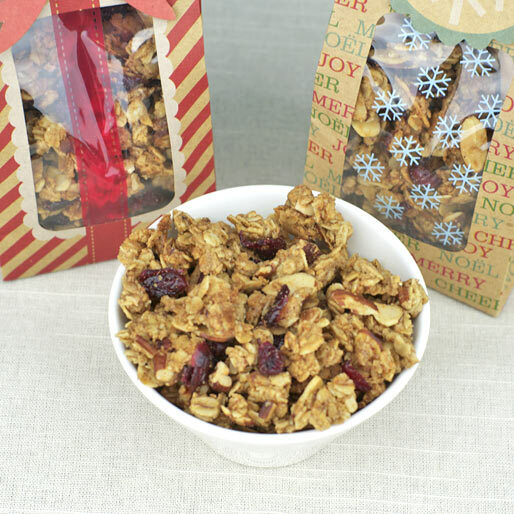 It's a taste of the holidays in a homemade cereal featuring cinnamon, nutmeg, cranberries and lots of crunchy clusters. Recipe number 3156. Submitted 12/19/2012.